The calm, serene rush of gulping down a pint, overlooking the sunset is a gorgeous feeling, one made sweeter when the golden-brown drink comes fresh from the brewery, Susegado has encapsulated this feeling on the shores of Baga. Susegado captures, through the eyes and the palate, what Goa was meant to be, a relaxing, stress-free abode of convenience and comfort, one that was not boggled by the city lights and their tenacious sound, by the paperwork and the jarring music, but the experience that leaves you floating in a cloud of contentment. Located in a state where alcohol dominates the discourse, we were sure that a brewery in the drinking capital would create more than just an uproar, hence we decided to sit down with the experienced spearheads of Susegado to gain an insight into their Goan adventure. Our production will continue to be in Goa, even when we scale up to a larger brewery. Goa is a great place to live, and it’s becoming increasingly easier to attract the right kind of talent. We are however looking into selling our beer outside Goa – starting with Singapore and the rest of SE Asia. Nikhil and I had been thinking of starting a microbrewery in Goa since 2009. When I moved back to India from Scotland, after having studied brewing and working there briefly. Nikhil’s cousin Arjun had already been living in Panaji for a few years by then, and he was quickly on board with the idea. Goa and most other states for that matter didn’t allow microbreweries at the time; none allowed microbreweries to distribute beer. The plan was put on hold, and I went on to brew in Singapore for a few years. When Goa did eventually come around to creating the law allowing for microbreweries, they made the most flexible and business-friendly microbrewery law in the country. The law allows for microbreweries to be a brewpub, production brewery, or both – with slightly varying rates of tax for each option. It was time for me to wrap things up in Singapore and get our original plan back on track. Nikhil’s brother Sameer had recently quit his job in Mumbai to manage their family coffee estate in North Karnataka – he was excited to be a part of the Goan craft beer revolution and joined the initial three. I moved to Goa in 2015 and we started selling beer by 2017. Is there a story behind the brand name and logo, that you could share with us? How did you settle on the name ‘Susegado’? Susegado is derived from the Portuguese word ‘sossegado’, which translates to ‘peaceful’ or ‘calm’ in reference to a place. In Goa, susegado has come to describe the relaxed Goan way of life – the unhurried pursuit of happiness. The four colours in our logo are drawn from the popular colours used for houses in Goa – white was reserved for churches and government buildings during Portuguese rule. Splitting the word into the four syllables by using the colours also makes it easier for tourists to pronounce Su-se-ga-do. You chose craft beer as your business proposition. What was the inspiration? Soon after graduation (as a computer engineer), work took me to London for a while – this was my first experience of non-lager beers and good lager beers. I didn’t think about beer as a business at the time, but I was blown away by the variety in America when I went there to study business management a few years later. This stint in America had me convinced that beer was my life’s calling – I was back in university for the third time, just eight months after graduating with an MBA. I haven’t thought of anything else since. Currently, you have three beers on tap and in circulation, could you talk to us about these beers? We have currently limited ourselves to offering just three beers on tap – this is largely due to the difficulty in getting any more space at the bars. There are only a handful of bars in India that have their own beer dispense infrastructure and offer multiple beers on tap. In general, the bonus is on the brewing company (or distributor) to provide the equipment and fit at the bar. Our beers are not filtered or pasteurized, and so we maintain a complete cold chain, including providing kegerators to all our customers – we are definitely the only beer brand to be doing this in Goa, and so it becomes very difficult to fit anything larger than a three-tap system. Coming back to the beers: we want to offer the broadest possible range while ensuring that we have a steadily growing sales volume. Dorado (golden in Portuguese) is our hoppy pale ale, or medium-bitterness IPA, depending on how one wants to classify it – I’m not much of a stickler for classifications. We use British hops for the smooth and satisfying bitterness and American hops for the aroma; unlike most pale ales / IPAs in the market, ours has a good proportion of light crystal malts to balance the hop bitterness and enhance the mouthfeel. Trigo (wheat in Portuguese) is a wheat beer with a tropical makeover from the Alphonso mangoes that go into the secondary fermentation. This replaces the orange peel and coriander more commonly found in beers of this style. Seasonal – we started off with a Vanilla Porter to round out the range, but eventually decided to have a rotating seasonal beer on the third tap. Beers so far have included a Scottish 80 Shillings, a Dortmund Export Lager, and the current hoppy lager with a combination of American hops. Most of our recipes are still evolving. We use primarily German and British malts; hops are from eastern Europe, UK and USA; dry yeast from Lallemand or Fermentis. Any plans for expansion to other regions? Does craft beer on bottle figure in your business plan? We plan to launch 5-lit mini kegs for the coming tourist season (October onwards), we plan to start bottling/canning at our bigger brewery – in a couple of years. Why not open a microbrewery? Are there plans to open the same in the following year? Or opening something similar to taproom? We are on the lookout for suitable partners for taprooms in Goa; as a company, we choose to be focused on brewing beer and not be distracted by running a kitchen and bar. We are very product focused and devote most of our effort to ensuring that we brew the best possible beers and that they are in the best possible condition when they reach the consumer. Production is largely driven by sales pull since we don’t want to fill up our cold room with beers that won’t be sold in the subsequent 30-45 days. How do you view the setting up of numerous microbreweries in the craft beer market? I’m thrilled with the many microbreweries starting up all over the country. However, I must add that I’m not a fan of the cookie-cutter brewpubs that have popped up all over Gurgaon and are spreading to some other cities. What do you see as the biggest challenge to the growth of the craft beer industry in India? The single biggest challenge to the growth of craft beer in India is the widely varying regulatory environment in different states and the resultant difficulties in distributing beer across state borders. What advice would you give to a greenhorn beer-preneur intending to take your path so that he/she could easily overcome the hurdles which you might have found difficult to cross? Do sufficient market research, start small, stay flexible, and remember that the bartender is your best friend. Susegado has placed a quite familiar charm on the Goan populace and their beckoning tourists, it has brought back the pristine charm and serenity that was once associated with the coastal state, one that is often blurred in the lights and sound of modern times. 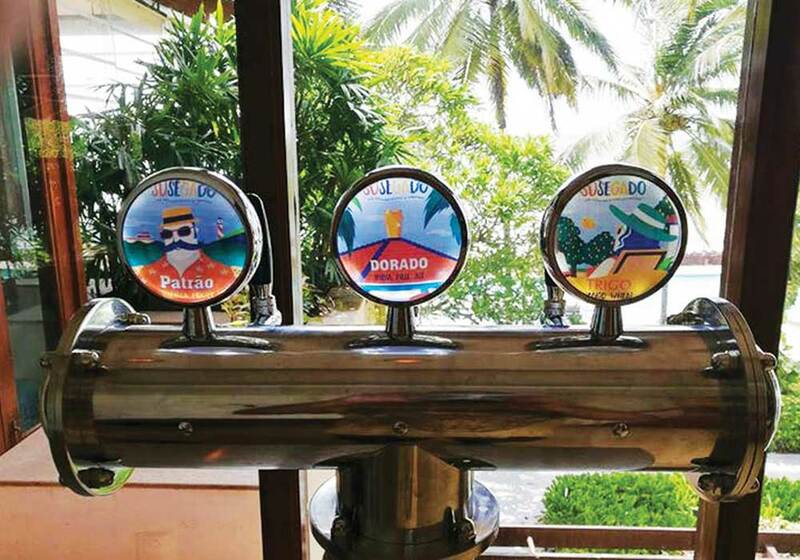 The folks at Susegado ensure that they mesmerize their audience through their restaurant and their salacious brew and aim to expand, not only the varieties of their beer but also their locations and potentially partner up with taprooms in Goa. This well-kept secret from Goa is sure to bring a whole new experience to what has often been touted as the “party capital”. A new experience in Goa is filled with tranquillity and an air of relaxation, masked in a beautiful golden brown, brought to you by Goa’s finest, Susegado.